Spooky brownies are a simple and straightforward Halloween dessert. 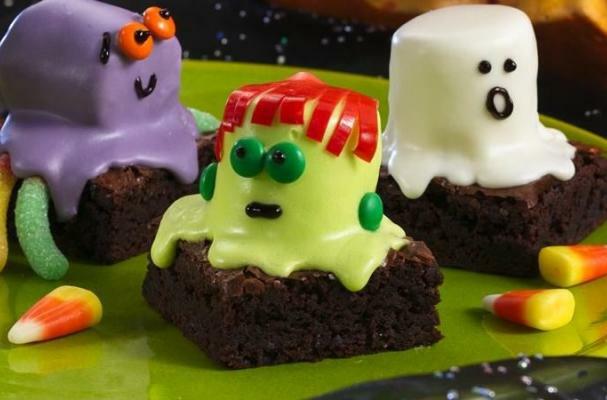 Brownies made from a box are topped with marshmallows decorated to look like iconic Halloween characters like Frankenstein's monster, a ghost, and a spider. The whole family can join in to help create these terrifying treats. 1 box (1 lb 2.4 oz) Betty Crocker™ Original Supreme Premium brownie mix (water, vegetable oil and egg called for on brownie mix box). Heat oven to 350°F (325°F for dark or nonstick pan). Grease bottom only of 8-inch or 9-inch square pan with cooking spray or shortening. Make brownies as directed on box. Cool completely, about 1 1/2 hours. Cut into 4 rows by 4 rows, making 16 brownies. Divide frosting among 3 small microwavable bowls. Heat frosting as needed: microwave 1 bowl uncovered on High about 10 seconds until frosting can be stirred smooth. If frosting becomes too firm while decorating, microwave on High an additional 5 seconds; stir. Decorate as directed below, using 5 or 6 brownies for each bowl of frosting. Franken-Brownies- Add 3 drops green food color to frosting in 1 bowl; mix well. Top each of 6 brownies with 1 large marshmallow. Spoon 1 tablespoon green frosting over each marshmallow to coat. Decorate with green baking bits for eyes and ears. Use black gel for mouths and centers of eyes. Cut fruit snack to use for hair. Boo-Brownies- Top each of 5 brownies with 1 large marshmallow. Spoon 1 tablespoon white frosting over each marshmallow to coat. Use black gel for eyes and mouths. Spider Brownies- Add 2 drops pink food color and 1 drop blue food color to frosting in 1 bowl; mix well. Top each of 5 brownies with 1 large marshmallow. Tuck gummy worms candies under each marshmallow for legs. Spoon 1 tablespoon purple frosting over each marshmallow. to coat. Use orange baking bits for eyes. Use black gel for mouths, centers of eyes and eyebrows.